Many have written positive reviews for Xiah Junsu’s musical acting, which began on the 26th last month, stating that he was so good that it was hard to believe that it was his first performance. One of the reasons why idol stars should not enter the musical market is because “If that person is set as the main character only because of the fact that his or her ticket power is great, the identity of the musical could be damaged.” Many experts have stated that the majority of idol group members who participated in musicals last year did not pay much attention to the execution of their roles. Musical critic Won Jong Won stated, “I don’t see any interest from idol stars who are participating in musicals to use this opportunity to expand their hidden talents and skills.” He also said, “Using them as a marketing tool only to sell a lot of tickets will bring a big blow not only to the musical market, but also the idol star’s image. The reviews for Mozart!’s Xiah Junsu are mostly positive. Xiah Junsu also spent some time in the hospital because of stress that accumulated from many things including rehearsals. He would repeatedly go to the hospital for a day from fatigue and then perform the next day. Conclusively, ‘Mozart!’ is being labeled as a successful musical that is attracting large crowds of audiences. 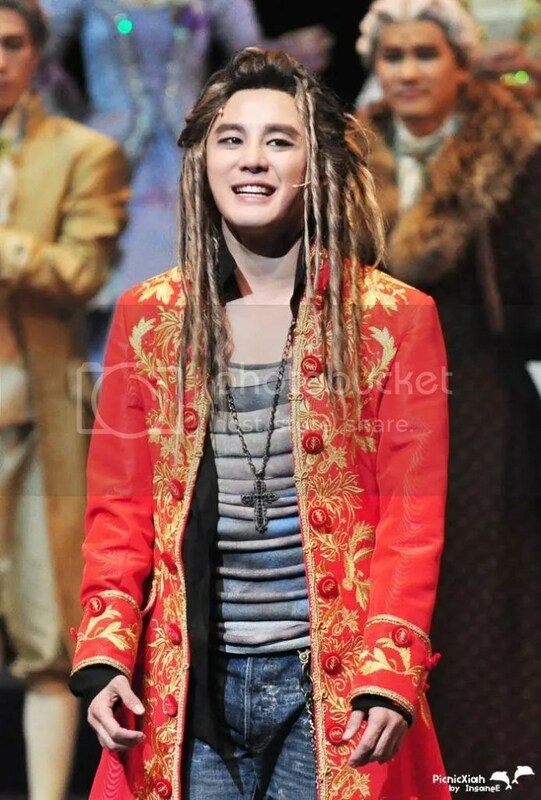 Xiah Junsu proved not only his ticket power in ‘Mozart!’ but his abilities and competence as a musical actor. [TRANS]100128 Mozart Added Pusan Performance. Xiah? Hello, this is EMK Musical Company. Thank you so much for your much interest in our production. Hello everyone. Thank you for your interest towards “Mozart! The Musical”. All the “Mozart!” performances by Kim Junsu have been sold out. However, we receive a lot of enquiries about seat availability every day, and thus we have decided to open up an additional seating area that is not utilized for other performances. The additional seating is shown below, from the grey areas upwards. This area is the same as the S seating area. There might be some limitations for some of the seats in those areas, and 20-50% of the stage might be blocked. Even so, if you wish to watch the performance, the tickets for these seats can be bought online, one ticket per person, at the price of KRW$50,000. Junsu is genius. A truly gifted singer!! Simply amazing Junsu! Once again I learned that Junsu can do everything and anything so well! he gave me goose bumps throughout his performance. He sure is a man who keeps working hard and we surely fall in love with this guy. I am sure his condition was not perfect due to his recent sickness, yet his performance was superb! I noticed that when he is not with the other members, he looks taller in person, and very handsome and attractive. But then, to my surprise, a real kiss scene was there! Real kiss scene……I cannot even write a comment about it, because I am still in shock. My dolphin and angel Xiah is now a grown man….. The other fans at the performance said that, his parents, Junho, Yuchun and Jeajoong were there. Yuchun was with his mom and his friend. And the fans said that Jeajoong and Yuchun were watching them at the third floor. Some said that JJ, JS and YC were spotted at the Karaoke place. It must have been to celebrate, Jeajoong’s Birthday together. And after that they went to Yuchun’s house. I hope they had a great time together. I am still in shock at this moment of time as I write this report. Junsu’s performance was amazing and that kiss scene…. I just saw Junsu’s Mozart performance. His singing voice gives you goose bumps all over your body. because Junsu’s magnificent performance made me speechless and numb. I could not move my body for a while after the show had ended. We all talked about Junsu’s kiss scene. His kiss scene did not look bad at all to me; it was not that deep scene at all to give me a shock. More than anything, what I thought was that I want as many people as possible to see his performance. He looks like a fish (T/N Dolphin?) released in the water! His performance is magnificent and Junsu is truly amazing singer/performer! You all must see Xiahzart! 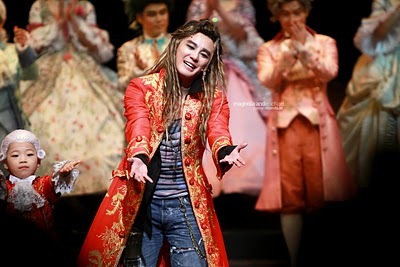 [News] 100127 Xiah Junsu At Musical Mozart! The Sejong Center Filled With 3,000+Fans! where a performance of the musical “Mozart” was opened on the 26th. The place was filled with the TVXQ fans to watch the TVXQ member Kim Junsu (stage name Xiah Junsu) who played the leading role of the musical Mozart on this day. 15 times of his performances (more than 45,000 seats) that Mr. Kim appears are sold out at the end of last year after an interval of ticket advance sale only in three hours. And the first stage performance was predicted to appear to be the concert place of TVXQ. The fans hurried up to take the first hand photos of Mr. Kim at the Sejon Cultural Center lobby on this day, and also every time Mr. Kim finished singing during his musical performance, the fans gave him great cheers. The fans even raised their voice yelling “AH!” when the scene where Mr. Kim kissed with the co-star, 콘스탄체. EMK musical production company appointed 35 male guards for an advance sale confirmation and the ticket confirmation for this performance. Only the fans that brought an advance sale confirmation letter messages were able to enter the lobby area. EMK set the entrance area restrictions into consideration to secure the security of Mr. Kim and the audiences. They will take the same step for a performance on the 28th and they will make it public in the near future to clarify their security majors for the future performances. Mr. Kim is also appearing in Mozart at Taegu performance, (from February 26 to March 7) for five times, and the server was downed at the time of the ticket sell on the 13th for the massive interest of the fans to purchase the advance sale ticket. TVXQ’s Xiah Junsu has increased sales by approximately 4 billion Won ($3.5 million). Xiah Junsu will take on the lead role of Mozart in the musical ‘Mozart!’. ‘Mozart!’ opened at the Seoul Sejong Cultural Center on the 20th. 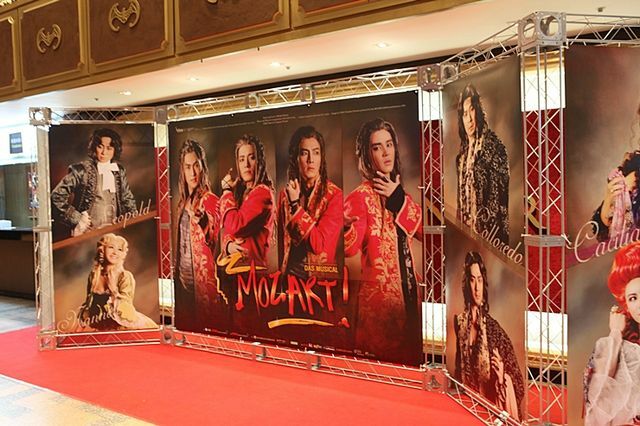 Many in the domestic musical industry are saying that “‘Mozart!’ already had the money needed to cover the productions costs even before it had its first show.” The total production costs for ‘Mozart!’ is around 4 billion Won. There is no other way to explain this situation other than the ‘Xiah Junsu phenomenon’. There are 4 people who will play the role of Mozart and they are Xiah Junsu, Park Gun Hyung, Lim Tae Gyung and Park Eun Tae. They will be rotating every day for the performance. As soon as ticket reservations were open to the public, the number of tickets left on the nights that Xiah Junsu was scheduled to perform quickly depleted till they all reached ‘0’. The Sejong Cultural Center’s theater has 3000 seats. 452 VIP seats, 890 R seats, 538 S seats, 482 A seats, 362 B seats, and 256 C seats. The price for the tickets range from 20,000 Won ($18) to 120,000 Won ($106) on weekdays. In the case that a show is performed on a weekday, one performance brings in 234.8 million Won ($ 206,000). On weekends, each performance brings in 264.6 million Won ($233,000). As Xiah Junsu is scheduled to perform in 8 weekday shows and 7 weekend shows, he is bringing in sales of 3,730,600,000 Won ($3.28 million). There are also the provincial performances to consider. There will be shows in Daegu and Suwon and currently, Xiah Junsu is confirmed to perform in Daegu. There are 1954 seats in the Daegu Gaemyung Art Center. Xiah Junsu will perform in five weekend shows in Daegu. If the amount earned each night in Seoul is multiplied by two-thirds to find the revenue in Daegu, Xiah Junsu would still have earned ‘Mozart!’ 850 million Won ($747,000) in ticket sales. If both these amounts are added, it totals in at 4,580,600,000 Won ($4.03 million). If Xiah Junsu decides to perform in more provincial shows, this number will rise. EMK Musical Company, that is in charge of ‘Mozart!’, seems to be expecting sales of side products such OST CDs and pamphlets to rise rapidly as well. According to the information about people who reserved tickets for ‘Mozart!’ on ticket reservation site Interpark, 92.5% of buyers were female while 7.5% were male. This seems to be the strength of the Korean and Japanese female fans. Usually, women do attend musicals more than men but never has the division been so apparent. The people who watch the musical ‘Chicago’ are 64% female and 36% male. Even for ‘Hairspray’, the division is 66% female and 33% male. Xiah Junsu was hospitalized recently due to fatigue. He was there for one day and was told to rest after being diagnosed with an accumulation of fatigue. Xiah Junsu’s first performance will be on the 26th. As the role of Mozart has been divided between four people, it is near impossible to not be compared to the other three. This is probably the most stressful part for him. 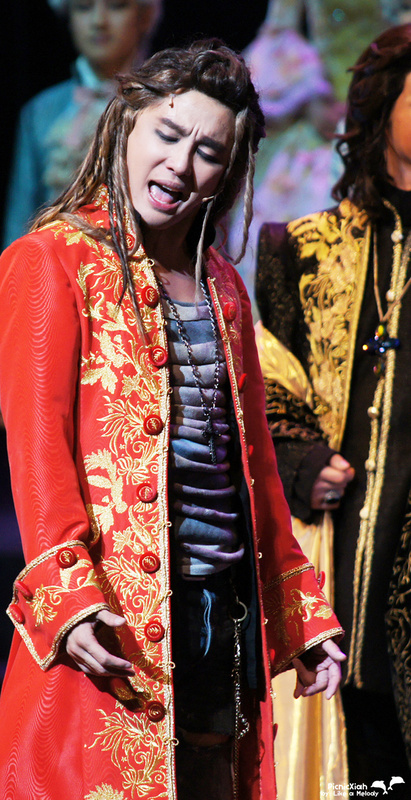 He must now prove that his capability as a musical actor is as great as his ticket power.